Kerala PSC has invited applications to the post of Assistant grade 2 in various Companies, Corporates, and Boards under Government of Kerala. Name of the post which is equivalent to Company Assistant grade 2 will be different in different organizations. Those names include Junior Assistant/ Cashier/ Assistant Grade II/ Clerk Grade I/ Time Keeper Grade II/ Senior Assistant/ Assistant/ Junior Clerk etc. Kerala PSC is recruiting Assistants for KSFE Ltd./ KSEB Ltd./ Thrissur Corporation KMCS Electrical Wing/ Kerala Minerals & Metals Ltd./ KELTRON/ Kerala State Cashew Development Corporation/ Malabar Cements Ltd/ Kerala State Handloom Development Corporation/ Kerala Agro Machinery Corporation Ltd./ Travancore Titanium Products Ltd./ Kerala Land Development Corporation Ltd./ Development Authorities in Kerala/ KSRTC/ Kerala Live Stock Development Board/ State Farming Corporation of Kerala Limited/ Kerala State Development Corporation for SC & ST Ltd./ Kerala Artisans' Development Corporation Ltd./ SIDCO/ Pharmaceutical Corporation (IM) Kerala Ltd. (Oushadhi)/ Handicrafts Development Corporation of Kerala Ltd./ Kerala State Film Development Corporation Ltd./ Foam Mattings (India) Ltd./ United Electricals Industries Ltd./ Kerala State Drugs & Pharmaceuticals Ltd./ Kerala Electrical & Allied Engineering Company Ltd./ Kerala Shipping & Inland Navigation Corporation Ltd./ Kerala Headload Workers Welfare Board/ Kerala Labour Welfare Fund Board/ Kerala Motor Transport Workers Welfare Fund Board/ Kerala Toddy Workers Welfare Fund Board/ Other Welfare Fund Boards. Monthly salary of Assistants in different Government-owned companies will be decided by the same organization. Kerala PSC has updated the date of examination of Corporate Assistant examination. It will be conducted on 05/09/2018 (01.30 PM to 03.15 PM). Candidates can generate and download the Admission Tickets through their One Time Registration profile in the website www.keralapsc.gov.in from 06/05/2018 to 20/05/2018. It is important to note that, those who have not downloaded their hall tickets before the given time period will not be allowed to appear the examination. Click on Click on Statewide- Direct - General Notifications. Kerala PSC notification for Company Assistant recruitment will be listed here. Look for category numbers 399/2017 and 400/2017, click Apply. Make sure you have applied for both notifications. Age limit to apply for the post of Assistant in various boards, companies, and corporates under Government of Kerala is 18 -36 years. OBC and SC/ST category candidates will get legally allowed upper age relaxation. Educational qualification required to apply for Company Assistant Vacancy in Kerala is pass in B.A/B.Sc./B.Com. A degree of a recognized University or its equivalent. If you are interested to get a job on Kerala Government-owned companies or boards, it is the right time. All you have t do is to prepare well for the coming Board/Corporate Assistant examination conducted by Public Service Commission. While preparing for the Kerala Corporate Assistant test, you must have the right study materials. 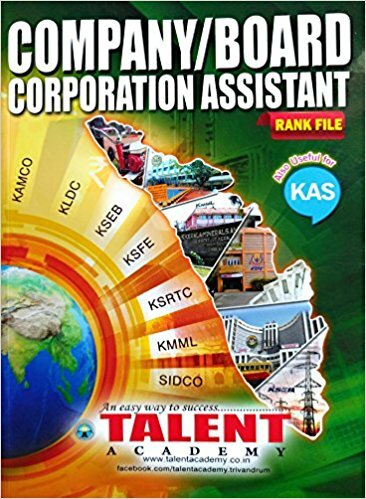 Studying the syllabus oriented Company Assistant rank files and solved previous year question papers will definitely help you score high on this examination. Company Assistant examination by Kerala PSC is degree level examination. To get the latest syllabus, visit the link below.